Boil some water. In a bowl, place sun-dried tomatoes and cover with boiling water. Set aside to soften. When sun-dried tomatoes are soft, drain well and sponge dry with paper towels; finely chop. In another bowl, whip cream until soft peaks form. 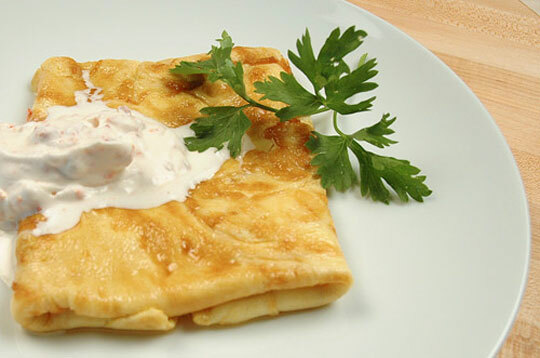 Fold in sun-dried tomatoes, mayonnaise and pepper. Set aside. To make each omelette, in a bowl beat 3 eggs. Salt and pepper to taste. In a frying pan, melt a little butter and cook eggs until almost set. Fold in each side of omelette and slide onto toast on a serving plate. Top with a dollop of Sun-dried Tomato Cream. Repeat for remaining omelettes.